I decided to stay for a couple of days and explore since I had never been there before. I love snorkeling, so headed south of Kona to Honaunau Bay. Everyone said it was the best snorkeling on the island, so off I went! When I arrived, there were a bunch of folks huddled in one area, so I headed over to check out what they were looking at. As I swam over a spinner dolphin shot out of the water into the air spinning around like 5 times! Everyone cheered! It was awesome. The dolphin swam through the crowd of people checking us out and jumping into the air every now and again. My heart was racing. I am obsessed with dolphins. It has always been a life long dream of mine to swim with them. Well, my dream certainly came true! The first dolphin disappeared into the blue abyss. I hovered there waiting for it to reappear again. 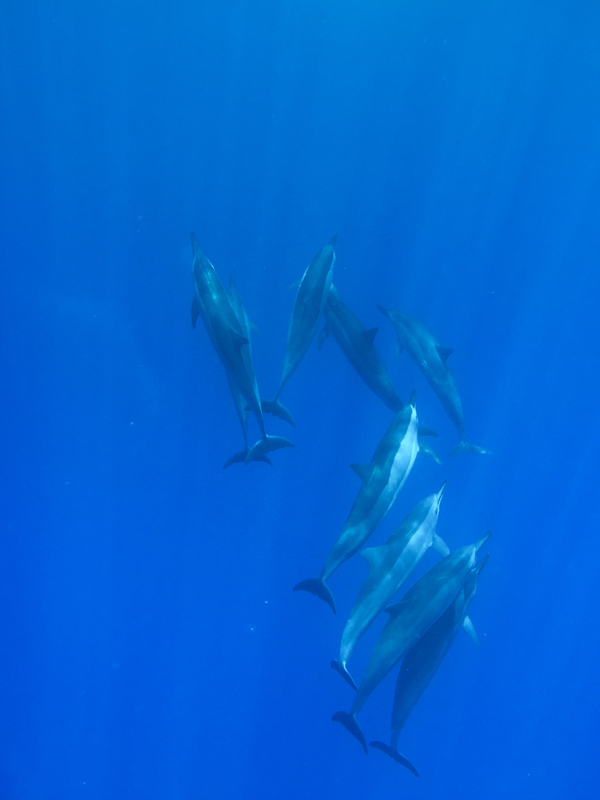 Then, about 40 feet below a dozen dolphins slowly swam by. I couldn't believe my eyes. 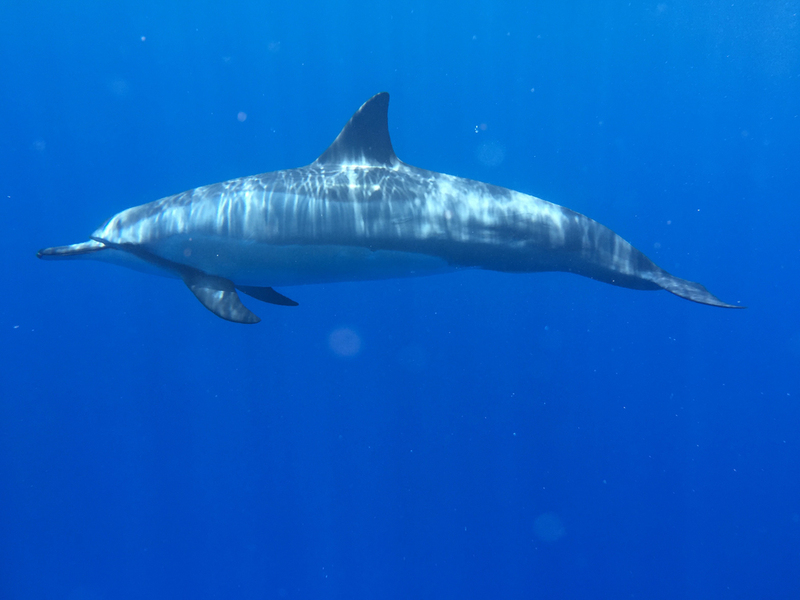 Another dolphin came to the surface for air and slowly swam towards me. I could have touched him we were so close! It was a special moment, indeed. Jamie Delaine (a super rad photog that's been inspiring me for years) contacted me a couple of days ago about her new project, The School Sessions. I was immediately touched by the heartfelt story. I've always wanted to help make a difference through my photography, but was never quite sure how. I've had ideas swimming around my head for years now. Helping needy people around the world, helping animals in need of care, saving the environment. :) Jamie and her husband, Randy, are passionate about helping others and have wanted to make a difference in this world, as well. Acting on this desire, The School Sessions was born. Their efforts and mission to help others is incredibly inspiring and touches my heart deeply. "The School Sessions is a one-day event across the globe on Sunday, April 12, 2015 to raise $200,000 to build a school in Haiti. Portrait photographers can sign up online to photograph one (or more!) portrait sessions and donate 100% of fees to The School Sessions." I will be donating as many mini sessions (families, couples, or whateva!) as I can book on April 12th! 100% of all session fees will be donated to the The School Sessions! Contact me and book your mini session today! "$200,000 will buy land and build a ten-classroom school for 220 students. The previous building was destroyed by the 2010 earthquake and these children (ages 3 to 16) are in need of a earthquake and hurricane-proof school to learn and grow." "By empowering hundreds of photographers across the world with a simple way to give back, together we will meet our goal. Join us in Making Haiti’s Future Bright." Nickie & Rudy were awesome, sweet, fun, down to earth, and totally rocked my camera. I'm super excited to share the images from their Kauai elopement soon! I am absolutely in LOVE with Kauai. It's lushness is intoxicating. Mountains, rivers, waterfalls, jungles, big trees, open fields, and a mellow vibe. I would be perfectly happy to travel there as much as possible, so if you're getting hitched on Kauai...book me! :) I'm more than happy to fly over for a quick trip. Here are a few snaps from the adventure. Enjoy!